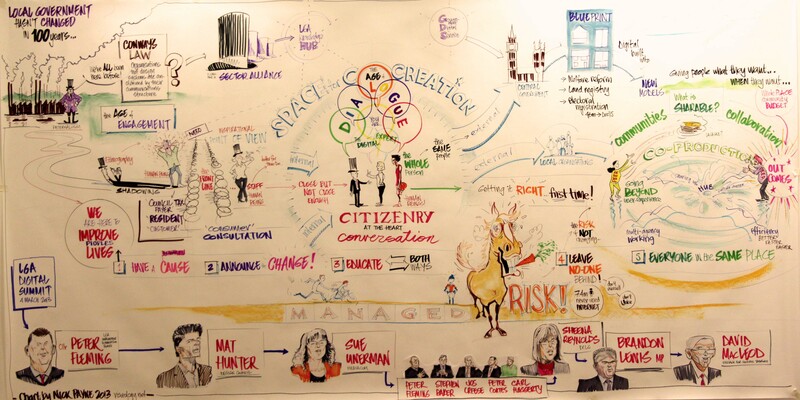 They say a picture paint a thousand words and this was never more true that this great pictorial summary of the LGA Digital Summit; which was a great opportunity to really explore how the internet can deliver improved services and access. The day was hosted by BBC News Channels technology programme Click’s presenter Spencer Kelly who was a quite suburb choice and kept a packed agenda on track with wit. For me this was the third day in a series of days looking at the role of technology in Local Government from the brilliant first Facebook Councillors Boot camp day at Facebook’s London HQ to the Digital Services event with APSE at Elstreet studios; across all three there were two key themes. Firstly technology is here to stay and that the successful application of this is about leadership rather than just how brilliant you can build that app. Secondly how do we move systems and channel shift when there are still people that such a single minded approach would exclude, often the very people we are seeking to support. I suppose there is a 3rd that we are current trying to solve with an investment decision by us Conservatives on the County Council to invest £11M in bringing Broadband to 100% of our county, till then there are some parts of the county on dial up! But perhaps the future also belongs to the penetration of mobile devices, there are some wonderful applications that could say Suffolk County Council millions of pounds, such as the Love Lewisham one where through a simple picture and an app you can report pot holes, fly tipping and graffiti to the right teams the data can almost immediately they will get the job paperwork going.